The blinds have just been increased to 3,000-6,000 with a 500 ante. There are now 146 players left with the top 130 finishing in the money. The average chip stack is 133,000. 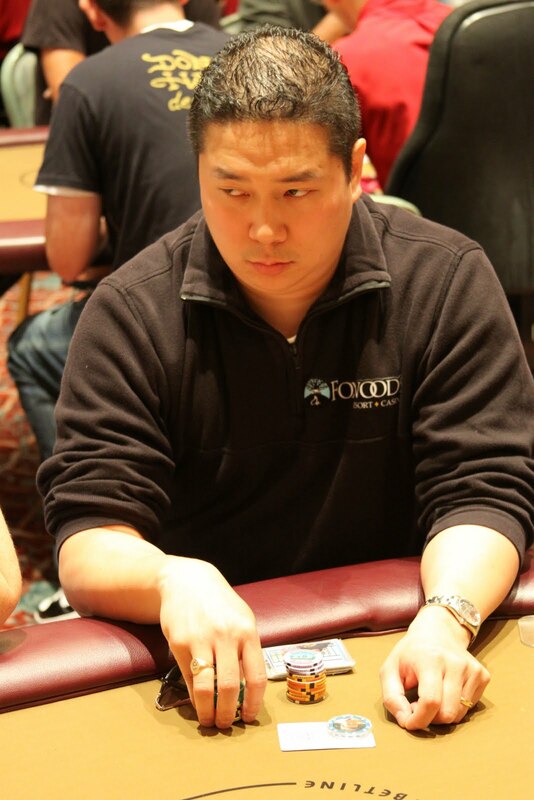 2009 WSOP Main Event Runner-Up Darvin Moon is eliminated from the $340 NLHE Foxwoods Mega Stack Challenge event when his pocket tens fail to hold up against his opponent's pocket fours. The players are currently on a short break. 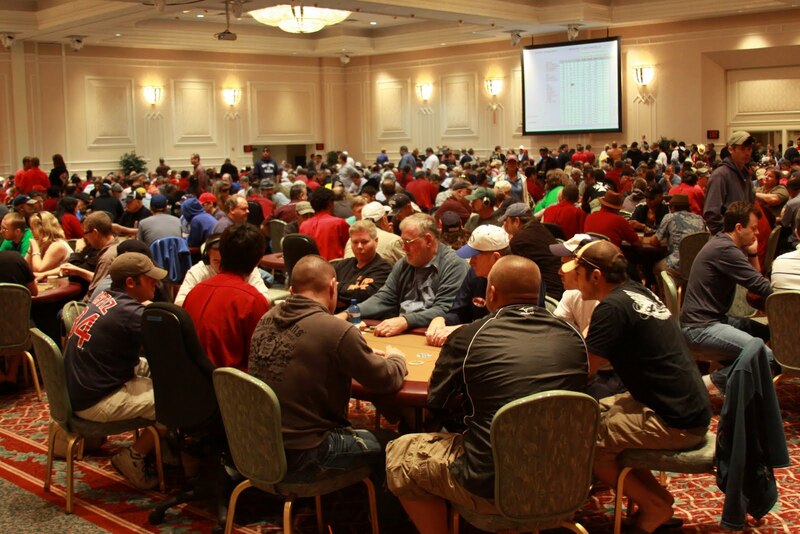 When they return, the blinds will be increased to 2,500-5,000 with a 500 ante. There are now 175 players remaining and the chip average is 111,000. 2009 WSOP Main Event Runner-Up Darvin Moon has been eliminated from the $340 Mega Stack Challenge event. The video of the bust out hand will be posted shortly. The blinds are being increased to 2,000-4,000 with a 400 ante. There are now 223 players remaining with top 130 spots cashing. The average chip stack is now just over 87,000 chips. The flop came A-10-x giving the big stack a set. The turn was a blank and Moon said "Just give me one of his queens please.". Sure enough, the queen hit the river, giving Moon the ace-high straight and the pot. He now has over 70,000 chips. Both Robert and Olga Varkonyi have been eliminated on Day One of the $340 Mega Stack Challenge. The blinds have been increased to 1,500-3,000 with a 300 ante. There are 250 players remaining with top 130 finishing in the money. The average stack is now 77,700. The players are now on a 10-minute break. There are just over 300 players remaining and the average chip stack is around 63,000. The blinds will be increased to 1,200-2,400 with a 300 ante when they return. Mega Stack Challenge host Darvin Moon got all in against an opponent after a jack high flop. Moon turned over pocket kings but his opponent showed pocket jacks for a set. The turn blanked but the king on the river kept Moon alive and doubled him up to around 40,000 chips. The blinds have been increased to 1,000-2,000 with a 200 ante. There are just under 370 players remaining and the average chip stack is around 53,000. The dinner break has come to an end and cards are back in the air in the $340 NLHE Mega Stack Challenge Event #1. There are eight minutes left in the current level and then the blinds will be increased to 800-1,600 with a 200 ante. The players in the $340 NLHE Mega Stack Challenge Event #1 are now on a one-hour dinner break. There are approximately 480 players remaining. With just two minutes left in level 8, there are approximately 500 players remaining in the $340 NLHE Mega Stack Challenge Event #1. At the end of this level, the players will take a quick 10-minute break and then the blinds will be increased to 600-1,200 with a 100 ante. Ryan Eriquezzo, who finished 131st in the 2010 WSOP Main Event, has been eliminated on Day One of the $340 Mega Stack Challenge. Bernard Lee raised to 2,025 from under the gun and is called by the player in the small blind. The flop came out [Kh][9c][6s] and both players checked. Lee had flopped a set but his opponent made his gut shot straight on the turn. The river came out the [2s] and Lee's set did not improve. We had a total of 1,295 players in Event #1, the $340 NLHE, at the August Foxwoods Mega Stack Challenge. 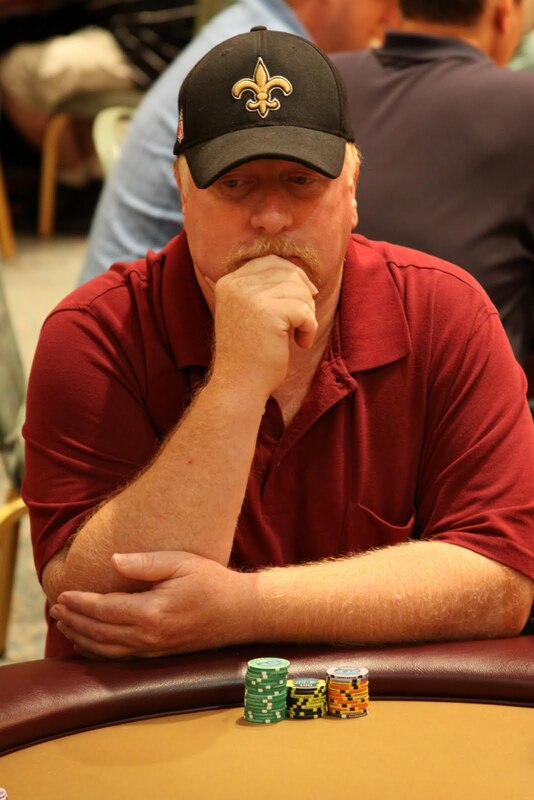 Foxwoods Poker Room Spokesperson Bernard Lee has built his stack up to just under 43,000 in the first few levels of the $340 Mega Stack Challenge. $340 Mega Stack Attracts 1,295 Entrants! Registration has now closed for Event #1 at the Foxwoods Mega Stack Challenge and the official number of entrants is 1,295! Payouts will be posted as soon as they are available. 2010 WSOP Main Event 24th place finisher Ronnie Bardah has been eliminated early on Day One of the $340 Mega Stack Challenge. 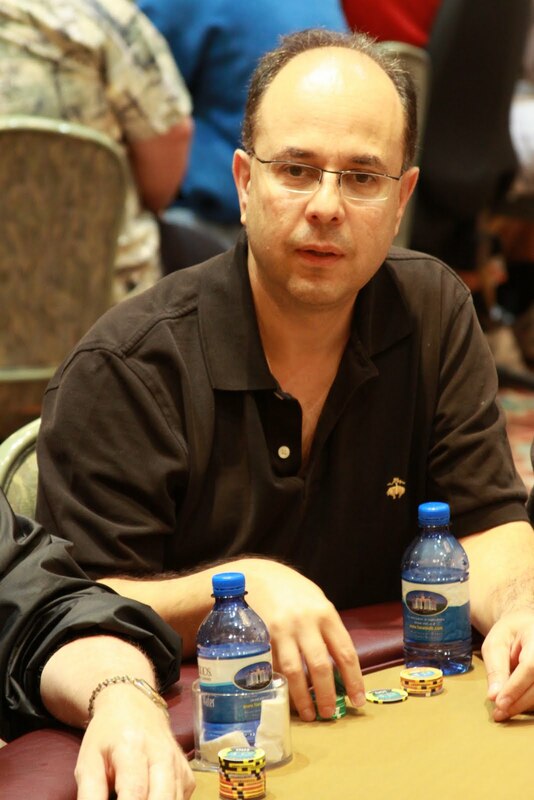 Robert Varkoyni on Day One of the Mega Stack Challenge. 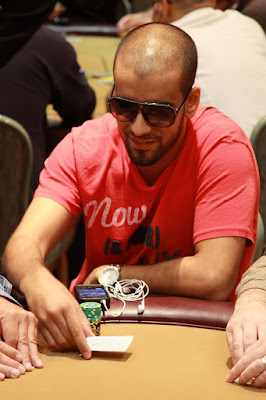 YouTube video: Darvin Moon Gives the Shuffle Up and Deal at the Foxwoods Mega Stack! 2009 WSOP Main Event Runner-Up Darvin Moon gives the "Shuffle Up and Deal" announcement at Event #1, the $340 NLHE, at the August Foxwoods Mega Stack Challenge. Players are still lining up to register and are now being given alternate numbers. With the massive turnout for he $340 NLHE event, all seats are just about spoken for. Tournament officials will be taking players currently in line and putting them on the alternates list. They will take their seats as players are eliminated from the event. 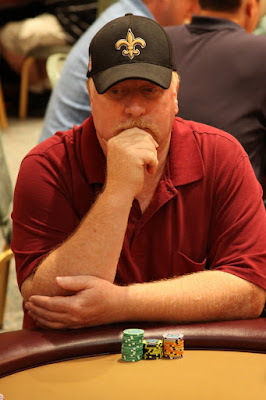 A quick sweep of the Grand Pequot Ballroom has already produced an impressive list of players. 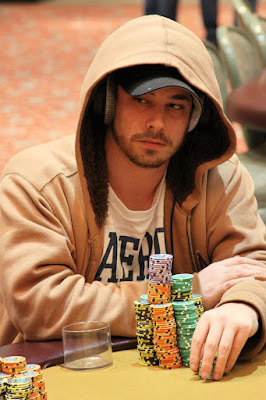 Included are the likes of 2009 WSOP Main Event Runner-Up Darvin Moon, 2002 WSOP Main Event Champion Robert Varkonyi, 2010 WSOP Main Event 24th place finisher Ronnie Bardah, Bernard Lee, James "Jcamby" Campbell, Kyle Loman, Spiro Mitrokostas and Eastern Poker Tour Co-Host Andrew Kaplan. Tournament tables are also being used in the Foxwoods Poker Room. We will sweep that room momentarily. 2009 WSOP Main Event Runner-Up Darvin Moon just gave our "Shuffle Up and Deal" announcement and cards are in the air on Day 1 of the $340 NLHE Mega Stack Challenge Event. 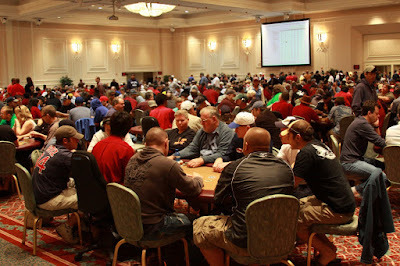 All players start with 15,000 in chip, levels are 40 minutes in length and the blinds are starting at 25-50. Mega Stack Challenge Starts Today! We are just about a half hour away from the start of the August Mega Stack Challenge! Grab your seat fast as there are already huge lines forming to get registered for today's $340 NLHE event.